Night fishing is allowed in the public water with many spectacular carp. 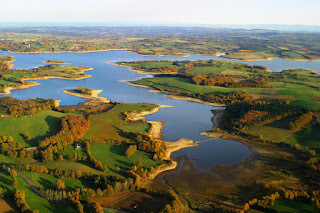 Sarrans is a reservoir in one of the most beautiful regions of France and is located on the plateau of Aubrac. Lac de Sarrans is known to be very difficult, especially due to the difficult conditions at the location. The big surprise here is precisely the unknown. The water is barely exploited and every year some huge carp unknown before are landed. In total, the Lac de Sarrans 35 kilometers long. The beauty is that the hundreds of kilometers of river Truyère, which wind path is through central France, finally opens into the reservoir. For many carp in this beautiful river is the Lac de Sarrans so the endpoint, meaning that there is a continuous influx of new fish. Finding an appropriate spot to fish is not easy, since about two-thirds of it is more difficult to reach because of the vegetation and altitude. Boats are allowed and most certainly help, especially at the end of the season, when the water level is lowest, and big parts of the lake are hard to reach. A third of the lake is easily accessible and there also are the best carp spots. A big advantage of the Lac Sarrans is that despite the holiday season, always be possible to find beautiful places with lots of rest. There is very little known of the carp on the lake, but we do know that there are some very large specimens of more than 25 kg are caught. Lake Sarrans known as very difficult, especially when it comes to the larger carp, with lots of natural food in the lake. According to various fishing reports on French websites also are frequently very large carp seen on the surface. The best time to fish the lake the Sarrans in the spring, When the carp swim upstream, and creates a sort of wave of migration for the annual spawning season. A big advantage is that night fishing is allowed all year on the entire lake. However during the spring when carp are spawning, several spots are a no go area and fishing is not allowed for a couple of months every year. The dam at the end of the lake is used to generate electricity, and is one of the main venues of operator EDF in France. In 2014, it became more so drained for the periodic vidange. Because there is a continuous inflow of water through the Truyère is to be diverted above the water through specially drilled tunnels. Who is near the Lac Sarrans can also choose from many beautiful public waters to fish for carp. So is also the Lot River near and it is located in the West Lake Saint-Étienne-Cantalès a very nice option for anglers.